After a long winter break, we finally got the season underway again with a trip to St Benets Wasps. In the first half we tried to get our passing game going but didn’t quite find the space as St Benets worked hard and limited our time on the ball. The game began fairly open and both sides committed to an attacking game, but we finally got the breakthrough midway through the half when Jayden found space and slid the ball past their keeper. Soon after we grabbed a fantastic second goal, as Jayden played a pass over his head, which George controlled and finished superbly with 2 touches. St Benets however continued to come back at us, and after we failed to clear our lines properly they pulled a goal back before the break. The second half the team responded very well as we began to realise we needed to improve defensively to hold off a persistent St Benets. Logan, Daniel, Harrison and Joe all contributed, and showed great discipline to hold their positions. George and Jayden continued to work tirelessly to provide a point of attack, and Ethan chipped in by being very quick off his line. As the half progressed both sides had chances, but George added another great finish to give us a 2 goal cushion. We unfortunately had a late penalty miss after Harrison had worked so hard to create the chance, but overall the commitment shown by the boys in the second half enabled us to see the game out as a 3-1 win. This week’s MoM goes to Toby who has shown great qualities since joining us only a couple of months ago, and this Sunday won the ball back for us on countless occasions. All round a good start to the year, and great to keep the momentum going. Gorleston Rangers would like to thank all of our players, parents, and suppoters for such a fantastic response to this years christmas raffle. Raffle sales totalled £3,377.50, considering the current economic climate and the weather during the month prior to the draw, this was an exceptional effort. The "A" Team boys took part in the Dereham 6-a-side tournament this weekend with the boys looking to carry on with their good results after winning the K&P Tournament 2 weeks before. The teams were made up of...... in the Red Team were Rafael (Goalie for the day!!!) 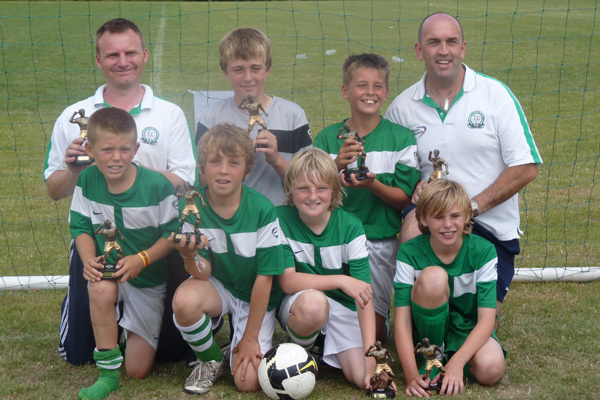 Dylan, Jack C, Lewis B, Callum, Ben G and Matty, and in the Green team Jordan, Jack M, Luke, Ben H, Spud and Zak who would have to manage all day with no sub. The Red team were in a group with Wymondham, Hethersett, Firside Lads, Old Catton Pumas and Horsford Boys, and the Green side in wtih Dereham, Mattishall, Firsdie Boys, Old Catton Tigers and Horsford Lads. From their group the Red team came top winning 4 and drawing 1 with no goals against, and the Green Team coming 2nd winning 2 drawing 2 and a lose in their 1st game which once again set up an all rangers tie in the semi final, this resulted in a 2-0 win for the Greens. In the final we played Firside lads, and to say we came up against an inspired goalkepper is no understatement!!! Time after time he stopped us taking the lead and at the end of normal and extra time in was still somehow goalless, so on to the dreaded penalties we went with the 6 players all taking one each..... and now was the time for Jordan to take centre stage and shine, he just missed the 1st Firside penalty but after that he was inspired and we went on to win 4-2 with a penatly to spare, so into the clubhouse for a celebratory cola!! Great effort from both teams on the day who showed what good football they can play. The goals for the day were Zak x5, Lewis B x2, Matty x2, Callum x2, Spud x1, Ben H x1, and Luke x1. 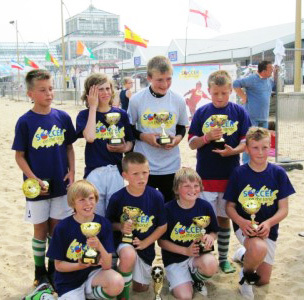 The Gorleston Rangers Under 11a team took part in this weekend's Soccer on the Sands tournament with a very strong squad playing the part of Japan. We were drawn in a group with Cameroon (North Walsham) France (Mundford) and Germany (Blundeston) and had to be placed in the top 2 to progress through to the Quarter Finals. 1st up we played Cameroon and after 5 minutes each way we had a 1-0 win under our belts through a Ben G goal and played very well, then after a break we faced France who had looked a good team in their first game. A close game resulted in a 1-1 draw with the goal again coming from Ben G. Last up in the group was Germany and after thinking we had already qualified we were guilty of taking the game far to lightly, losing 1-0 despite being camped in the German half for the 2nd half. Luckily we found ourselves through to the Quarter Finals on goal difference and we knew we had to take it up a gear or two to go any further. In the Quarters we faced a Portugal (Poringland) team that had won their group, and the team oozed class from the kick-off to come out with a 6-0 victory with goals coming from Connor x3, Spud, Mitch and Ben H and it could have been more!!! So on to the Semi-Finals, and it was win or home in a tight game against Holland (Rocklands Youth) where we played again very well, controlling play and defending impressively in a 1-0 win with the winner again from Ben G.
Break until the final with all the boys looking very determined in a game against a very strong looking Argentina (Morton Hall) side that had won every game and barely conceded a goal in the tournament, the team talk was along the lines of play your football and fight for every ball and the winners trophies will be ours, so in the game we took an early lead thro Zak and then defended like tigers, countering when we had a chance, and a final Ben G goal ensuring we had the World Cup in our hands!!! Time ticked on and at the final whistle the Japanese fans went wild!!! A 2-0 victory and some excellent dispays by every single player from goalie right through the team. Scoring 11 goals and conceding only 2, we were worthy winner in my opinion. Well Done Boys, you got what you deserved after working your socks off. Thanks to all our supporters, especially Paula and Julie for their Japanese words of wisdom, and also to Gary M for helping with the team. 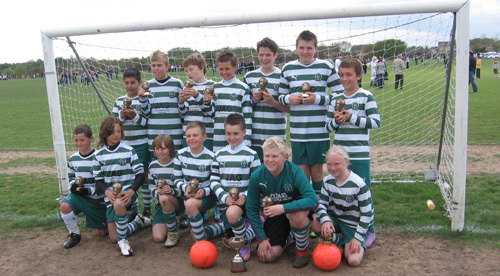 The under 12 a team added the Ipswich Open Cup to the N&SYL division 1 championship after a deserved 4 – 3 win over a good Stowmarket Town team. Not for the first time this season we made hard work of it, coming from behind 3 times. In the end our never say die attitude shone through. At times we passed the balI around superbly, but Stowmarket’s excellent forward kept our defence on edge with his strong running and hold up play. I would like to take this opportunity to thank the boys for their tremendous attitude and commitment shown this year. Retaining the N&SYL division 1 title for the third consecutive year is a great achievement. No training until further notice. Any queries ring Chris on 01493 601256.